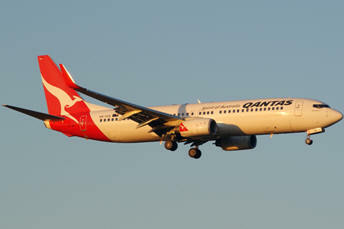 October 31, 2011 - On Saturday, Australia’s largest airline, Qantas Airways also known as "The Flying Kangaroo", shut down its flight operations indefinitely and locked out all union workers in an effort to shut down its unions. All flights were canceled except flights that were already in the air. Aircraft that were taxing out for takeoff were called back to there gates. Qantas Airways chief executive Alan Joyce said the unions' actions have caused a crisis for Qantas, "they are deliberately destabilizing the company and there is no end in sight." Joyce stated that all 108 aircraft will remain grounded until the unions representing pilots, mechanics, baggage handlers and caterers reach agreements with Qantas over pay and conditions. Australia’s government called an emergency arbitration court hearing on Saturday night to rule on Qantas’ shut down and to look at strike actions by its unions. Anthony Albanese, Australia’s Transport Minister stated he was disappointed in Qantas’ actions he described it as "disappointing" and "extraordinary" he was also upset that Qantas only gave him a three hour notice of the shut down. On Sunday, Barry Jackson, President of Australian and International Pilots Association said “following Qantas management’s unprecedented and unilateral decision to ground its fleet on Saturday there have been several erroneous reports both in the media and directly from management that we would like to clarify. Industrial action by AIPA pilots has not cost the company a single cent in revenue. Industrial action by AIPA has not delayed a single passenger or grounded a single flight. “Our entire public industrial action over the past 4 months has been to make positive in-flight announcements and to wear red ties with our campaign message on them. For Qantas management to respond to these reasonable and non-disruptive actions in this way is more than a gross over-reaction. “It is a sign that the current management has lost touch with the travelling public, its workers and the basic Australian ethos of free speech. We are hoping for a positive outcome from today’s talks and will provide updates as soon as we can. In the meantime we’d like to thank all of you who have expressed support for our pilots. Your kind words have been much appreciated. Speaking at Sydney Airport on Sunday, AIPA Vice President Captain Richard Woodward said the decision to strand thousands of Qantas passengers was clearly pre-meditated to take place the day after Joyce’s $2 million pay rise was approved. Woodward said “Alan Joyce obviously thinks Qantas is his personal plaything to use in his high-stakes game against pilots and other workers. He is happy to trash the travel plans of thousands and thousands of passengers completely unnecessarily. And let’s be honest here, this was obviously not a snap decision. He would have planned this destruction months ago. “Pilots have made it clear from the start that we would not take industrial action that disrupts passengers. We have stuck to that to this day. Alan Joyce on the other hand has opted to disrupt passengers in the most devastating way possible. Pilots have not been on strike and we are not seeking anything that would damage profitability. Pilots do not want to work low hours, nor are they seeking extra pay. “Instead of striking an eminently achievable deal with his pilots, he has chosen to act out his tough guy fantasies on Qantas passengers. It’s deplorable. We totally support Senator Nick Xenophon’s call for a Royal Commission. Australians have every right to find out what has happened here. In the meantime, the board should immediately sack their out-of-control CEO. The government should then look at taking steps to amend the Qantas Sale Act so that this sort of megalomaniacal behavior can’t happen at the top again. We believe Mr. Joyce’s action is unlawful and we are currently seeking legal advice. He has locked out short-haul 737 pilots who aren’t even involved in any action at all. On Sunday, by mid day An independent tribunal in Australia, Fair Work Australia ordered Qantas’s to resume all flights after hearing evidence from the airline, unions and government at an emergency session in Melbourne. Fair Work Australia, "We have decided to terminate protected industrial action in relation to each of the proposed enterprise agreements immediately." This will require the unions to return to the negotiating table and come to an agreement within 21 days or face binding arbitration. Qantas chief executive Alan Joyce said the tribunal decision "provides certainty for Qantas passengers", adding: "We will be getting our aircraft back up in the air as soon as we possibly can. It could be as early as Monday afternoon on a limited schedule with the approval of the regulator."